Enter the letter or number you would like stamped on each disc in the order you want the stamps to fall (left to right when being viewed). Only one stamp is allowed per disc. Write BLANK if you would like a disc left blank. 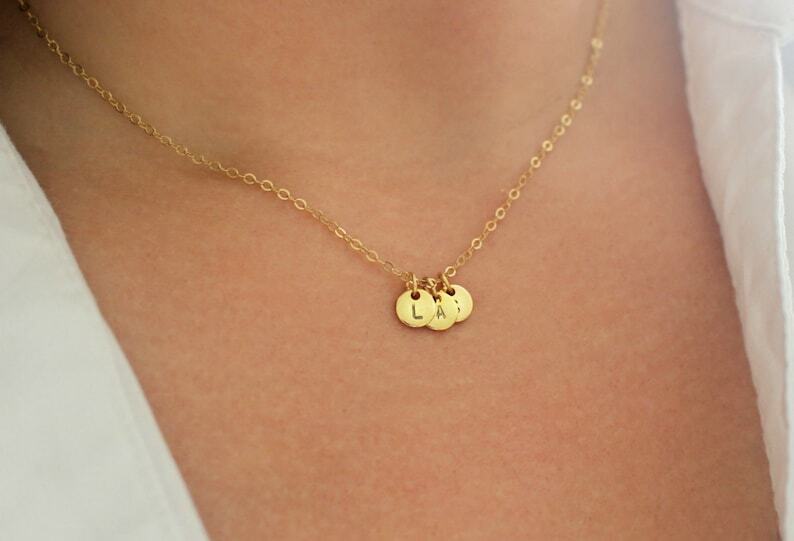 6mm golden discs gleam on glittering gold chains to create this gorgeous, one of a kind necklace custom made especially for you. 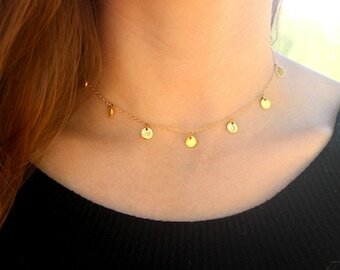 Please select the number of discs you would like hung on your necklace as well as the length of chain for the necklace. When checking out, please leave a note with the letter or number you would like stamped on each disc in the order the discs will read (left to right when being viewed). If you would like a stamp left blank, write BLANK. Only one stamp is allowed per disc. The stamps are 2mm tall capital letters or numbers. The 6mm gold plated discs are hung on dainty yet strong 14k gold filled chains finished with a 14k gold filled spring ring clasp. The necklace shown in the photos is 17 inches long. Would you like a chain length or number of dics that isn't listed? Would you like the length to be adjustable? Have an idea for a custom order? Please contact me and I will be very happy to help you! Jewelry will be placed in a gift box wrapped with ribbon and tucked inside a decorative bag with tissue paper. A gift note can be included. Just what I was looking for. 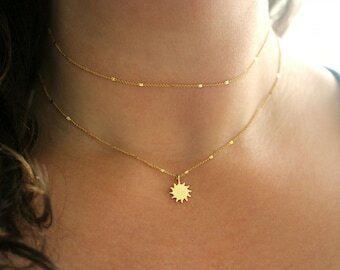 Super cute and dainty. I got 15" length so that the crystal rests just below my neck. I docked one star because the crystal is so light that it constantly shifts off center. If for any reason you are dissatisfied with your purchase it may be returned and refunded for the full purchase price, minus the cost of shipping. All returns must be made within 7 days of receiving the item. All items must be returned in their original condition and packaging materials. The buyer assumes all responsibility for the cost of returning an item. Please contact me through Etsy if you would like to return your item. Please note that some custom orders may not be returnable or refundable. If this is the case you will be notified before actually purchasing your order. Current processing time is 1 - 3 business days. By default, domestic orders are sent via USPS First Class Mail and generally take 2 - 5 business days to arrive. However, packages can take up to 6 weeks to arrive, though this is very rare. Shipping charges include shipping cost, tracking information, insurance, and packaging costs. Exceptions are explicitly stated in the items' description. By default, international orders are shipped by United States Postal Service International First Class Mail. Shipping charges include shipping costs, package costs, and insurance against loss or damage. When the package arrives in the customer's country it is transferred into the care of that country's government sponsored mail service (i.e. Royal Mail for the UK, Canada Post for Canada, Australia Post for Australia, etc). Limited tracking information is available through the customs order number, but this is not always reliable as the buyer's own government sponsored mail service is responsible for updating tracking information. Please keep in mind that I cannot control how long a package takes to be delivered, nor how long it is held in customs. Typically international orders take 2 - 6 weeks for delivery. International shipment of packages to Brazil cannot be insured. Limited tracking information is available with the customs order number and depends solely on the Brazilian mail system for updates after the package leaves the U.S. All sales to Brazilian customers are nonrefundable once the order has shipped. Expedited shipping by Priority or Express mail is available for purchase upon checkout for both domestic and international orders. Please note that order processing time still applies and your order will be shipped 1 - 3 business days after purchase. If you would like your item shipped more quickly or by a different carrier, please send me a message and I will be happy to set up a custom order for you. Each item will be shipped in a recycled paper jewelry box. Certain items may be shipped in a velvet drawstring bag. The customer is responsible for providing the correct shipping address. By purchasing an item, the customer assumes all responsibility for shipping costs. If a package cannot be delivered to the address provided and is returned to me, the customer will be notified and asked to pay for the additional shipping costs required to resend the package. Shipping times can vary greatly. For US domestic orders, please contact me if you haven't received your package within 20 days of shipment. For international orders, please contact me if you have not received your order within 40 days of shipment. Though it does not usually take that long, packages have, on rare occasions, had an exceptionally long delivery time. Most items can be customized to fit your exact needs. If you would like the length of an item adjusted and you don't see your size available, please send me a message prior to purchasing the item and I will set up a custom order for you (please note that adding extra length to an item may incur extra fees). I welcome wholesale orders. If you are interested in purchasing multiple items from my store at a wholesale price, please send me a message. I would love to make jewelry for your special day! I offer discounts on bridal orders of five items or more. Please contact me for more info. To prolong the life of your jewelry, do not shower or swim with it on. Store in an air tight container. Clean gently with warm water and soap and dry thoroughly with a soft towel. Buff gently with a soft jewelry polishing cloth as needed.